Bats find their way acoustically when they are flying by using echolocation calls, often also employing them when hunting for food. A team of scientists from the Max Planck Institute for Ornithology in Seewiesen and the Ludwig-Maximilians-Universität Munich has now discovered how these animals handle interference in the form of environmental noise. They analyzed thousands of echolocation calls under various natural ambient noise conditions and showed that bats adapt both the amplitude of their calls and their duration to the noise level. Although every individual reacted slightly differently in the process, all the mechanisms used improve the detectability of the signal. All bats perceive their environment through ultrasonic sounds which they emit and by evaluating the echoes they receive from them. 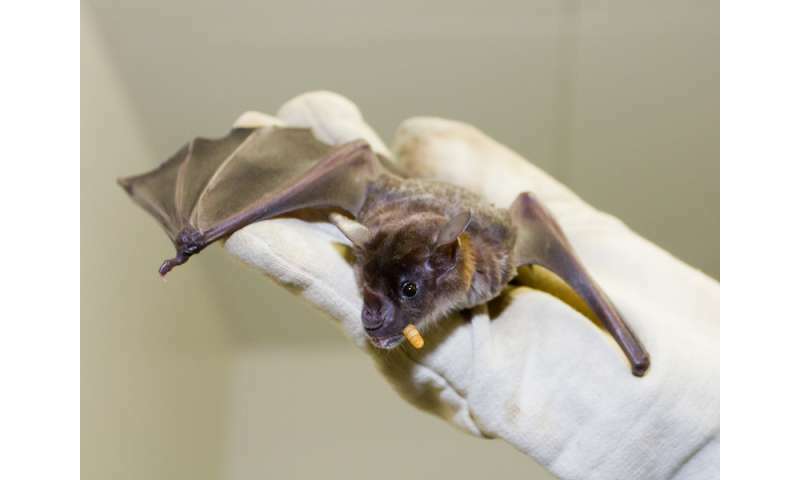 Many bats use these calls when looking for food, for example those that hunt insects in flight. Animals such as bats that rely heavily on acoustics therefore need mechanisms for adapting their vocalizations to environmental noise. One form of well-researched noise-dependent adaptation of acoustic signals is the so-called Lombard effect: in response to increased environmental noise, the amplitude of the signal is amplified accordingly. This basic effect for maintaining communication is known in birds and mammals, including humans. A team of scientists from Seewiesen headed by Lutz Wiegrebe from the Ludwig-Maximilians-Universität Munich has now, for the first time, evaluated the amplitude and duration of signals emitted by bats, as well as how often they are repeated, under various, controlled noise conditions. The scientists played environmental noise to pale spear-nosed bats (Phyllostomus discolor) in three frequency ranges at different volumes (28, 40 and 52 dB SPL), and in the process recorded their echolocation signals. They then evaluated them mathematically in order to understand the animals' acoustic perception. The scientists discovered that for bats too, the most important and strongest mechanism for compensating noise is the amplitude of the signal: all the animals called more loudly in noisy environments, doing so by as much as 8 dB. Additionally, the duration of the calls increased by between 13 and 85 percent and, according to the scientists, this also helps to make the signal more detectable, but only by a maximum of 5 dB. A further mechanism for compensating noise which the scientists found under certain noise conditions is the formation of call groups. This enhances the probability to detect a signal through listening to it several times in quick succession. The scientists calculated that this can make a difference of up to 4 dB. "We found variances in the signal amplitude between individuals of almost two to eight dB under the same noise conditions. The duration of the calls was subject to equally significant variations," noted Holger Goerlitz, Research Group Leader in Seewiesen, registering his surprise at these results. The crucial factor, however, was that the total of these different individual responses led to the same result: "The ear evaluates different signal parameters such as the amplitude and duration of the sound, in order to detect signals", says Lutz Wiegrebe from the Ludwig-Maximilians-Universität Munich. Although the parameters vary, in summation they all enhance the detectability of the signals, and thereby support signal perception amidst environmental noise.